Lieutenant General Paul Talay Atal, Commander, Central Command, AFP warmly welcomed by Maj. Gen Raul M Farnacio, Commander, 8ID at the home of the Stormtroopers Camp Gen. Vicente Lukban, Catbalogan City, Samar on March 15, 2018. CAMP LUKBAN, Catbalogan City – The Commander, Central Command of the Armed Forces of the Philippines, Lieutenant General Paul T. Atal and Party visited the men and women of the 8th Infantry (Stormtroopers) Division, Philippine Army on March 15, 2018 at 10 o’ clock in the morning. Lieut. Gen. Atal was warmly welcomed by the Stormtroopers through a traditional military honors hosted by Maj. Gen. Raul M. Farnacio, Commander, 8ID. He was later briefed on the current security situation in Region 8. During his traditional talk-to-men, Lieut. Gen. Atal re-echoed to the troops that their Commander-in-Chief, President Rodrigo Roa Duterte is satisfied with the performance and accomplishments of the AFP. He encouraged the soldiers of 8ID to be proactive and to remain vigilant in terms of security to counter the act of violence of the enemies. He also lauded the troops for their sacrifices and hard work in the performance of their duty in serving the people and securing the land. Likewise, the awarding of cash incentive to 78th Infantry (Warrior) Battalion and 20th Infantry (We Lead) Battalion by Lieut. Gen. Atal was done in recognition of the unit’s admirable accomplishment against the Communist-NPA Terrorists in Samar and Leyte Island, respectively. 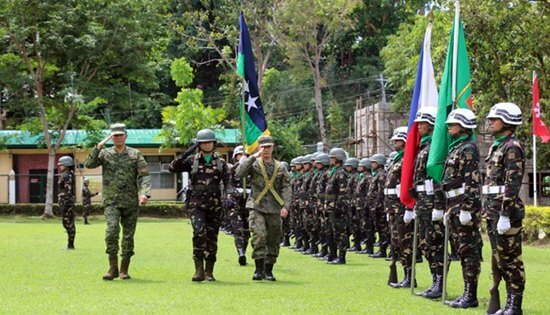 The visit of the highest AFP official in the Visayas provided a boost in the morale of the men and women of the 8th Infantry Division to continue their mission to protect the communities in the region from the atrocities of the Communist-NPA Terrorists.